VANCOUVER — Before Ian Mitchell could turn his full attention to making Canada's junior hockey team, he had to finish his final exams. The University of Denver sophomore is one of about two dozen athletes in this year's world junior hockey championship balancing hockey careers with a college course load. "It's a good way to juggle and kind of learn life skills at the same time," said Mitchell, a defenceman and finance major. Fellow Canadian Shane Bowers plays and studies at Boston University. "For me, I just thought it was the best for me to do for my development and my play," said the communications major, who put up 32 points in his rookie campaign last year. The Halifax native and Colorado Avalanche prospect said school's going well so far. "Hopefully I can play hockey as long as I can, but you know, if I have an education to fall back on, that doesn't hurt," he said. 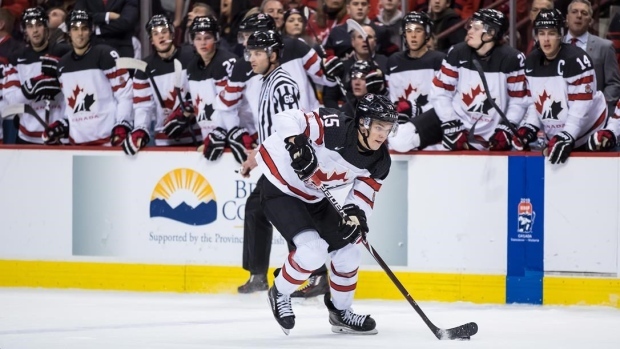 Being a collegiate athlete at the world juniors is a special experience, Bowers added. "It's cool to represent our school and the NCAA," he said. Team U.S.A. boasts 18 college players on its roster. The Czech Republic's Jachym Kondelik goes to the University of Connecticut. And Finland's Filip Lindberg is a student at the University of Massachusetts Amherst, while his teammate Aarne Talvitie attends Penn State. The prospect of playing hockey while going to school may be daunting, but Mitchell said there are many supports in place to help. At the University of Denver, student athletes have access to tutors and coaching staff are accommodating of academic schedules, giving players days off of training if they need to study. "So it's not too, too bad, honestly," Mitchell said. The Calahoo, Alta., native is thriving in the college environment. Last year, he was second in the NCAA last year when it came to points by a rookie defenceman. This season he has 11 points in 14 games. He's also excelling academically. The Chicago Blackhawks prospect was selected as a National Collegiate Hockey Conference distinguished scholar-athlete in his freshman year. Mitchell was asked last week if he's still posting good grades. "Oh yeah," he said. "Otherwise mom wouldn't be happy. That's always important." The other 20 players on Canada's roster all play for Canadian Hockey League teams. The teams play 68 or 72 regular season games a season, depending on what league they're in. U.S. college squads play about 34 regular season matchups, plus tournaments. Many players move to college or university teams when they wrap up their CHL careers. Mitchell said he considered playing for the Western Hockey League's Brandon Wheat Kings instead of going to school, but thought the college route was better for him because he'd always been a good student and comes from a family that really values education. "Obviously, the CHL is great. Obviously, there wouldn't be this many players here (from the league) if it wasn't the top option for a lot of players," he said. Now, he has a chance to compare experiences with his juniors teammates. "It's kind of cool that I can ask them what CHL life is like, and we can kind of talk about that a little bit," Mitchell said. Bowers, too, has had some chats about the similarities and differences, but it hasn't been the main topic of conversation in the locker-room. "We're not really talking too much about that, just kind of focusing on what's going on here (at the tournament)," he said.